For the device that detects that a train axle has passed a particular location, see Treadle (railway). A treadle (from Old English: tredan, "to tread") is a mechanism operated with a pedal for converting reciprocating motion into rotating motion. Along with cranks, treadmills, and treadwheels, treadles allow human and animal machine power in the absence of electricity. Before the widespread availability of electric power, treadles were widely used to power a range of machines. They may still be used as a matter of preference or in environments where electric power is not available. A treadle is operated by pressing down on its pedal with one or both feet, causing a rocking motion. This movement rocks a large crankshaft driving a flywheel. Treadles were once used extensively in creating textiles and clothing, powering spinning wheels, looms, and sewing machines. Elias Howe and Isaac Singer popularized their use and they became a fixture in households worldwide. 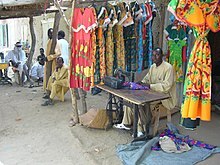 Today the use of treadle textile machines is mostly relegated to hobbyists and historical re-enactors, but they remain in use in the developing world. Treadles may be used to turn lathes for metal or wood, as in the pole lathe, or to power rotating or reciprocating saws. Treadle pumps are used to provide water for agricultural and domestic use in poor areas not served by water systems. Treadles were used to power phonograph cylinders. Look up treadle in Wiktionary, the free dictionary.